In fact, people around the globe now anxiously await each annual release. The United States Mint strikes American Silver Eagles at its various facilities. Known for sublime quality and craftsmanship, the United States Mint is considered one of the most premier sources of precious metals products in the world. Their products usually display designs that speak to Americans highlighting history, culture, or even significant symbols from the great nation. It was established in 1792, and has continually impressed collectors and investors with quality precious metals products over more than 225 years of operation. 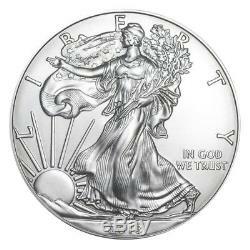 The famed Walking Liberty design is depicted on the obverse of this coin, portraying Lady Liberty striding toward the rising sun, clutching olive branches in her arm. Weinman in 1916, this design has become one of the most acclaimed portrayals of Lady Liberty successfully capturing the core values of the United States. The word Liberty encircles Lady Liberty, while the motto In God We Trust makes an appearance towards the right side of the obverse. On the other hand, the reverses of these coins bear John Mercantis rendition of the Heraldic Bald Eagle as featured on the National Emblem of the United States of America. Thirteen stars float hover above the Eagle, signifying the original 13 states that came together to form the United States. The bottom of this side features the purity and weight of the silver in the coin as well as the official face value allocated to it. 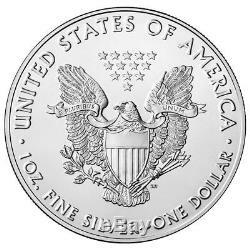 American Silver Eagle coins have been a collectible series of silver coins for a long time; they make excellent gifts for people interested in precious metal products that feature designs boasting iconic American imagery. Although the designs remain unchanged every year, owning every years release has become the norm amongst collectors and investors. These 2018 American Silver Eagles will make marvelous additions that help complete Silver Eagle collections, while also adding valuable silver to your portfolio. Moreover, due to their popularity and fame, Silver Eagles have historically witnessed easy liquidation should the need ever arise. Silver Eagles are among the most desirable silver coins in the world, and these 2018 BU coins will make superb precious metals investment assets as well. Add a dash of America to your precious metals collections, with the 2018 American Silver Eagle Coins. Not only are Silver Eagles the most popular silver coin in the world, but because they carry a lower premium price over the silver spot price, this combination will make them one of the most sought after coins in 2018. 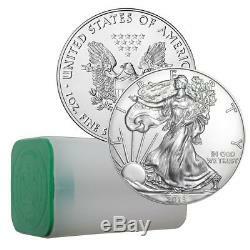 The item "2018 American Silver Eagle 1 oz Coin Sealed US Mint Roll of 20" is in sale since Monday, January 22, 2018. This item is in the category "Coins & Paper Money\Bullion\Silver\Coins". The seller is "sdbullion" and is located in Ottawa Lake, Michigan.